Period of Transition in Italy. 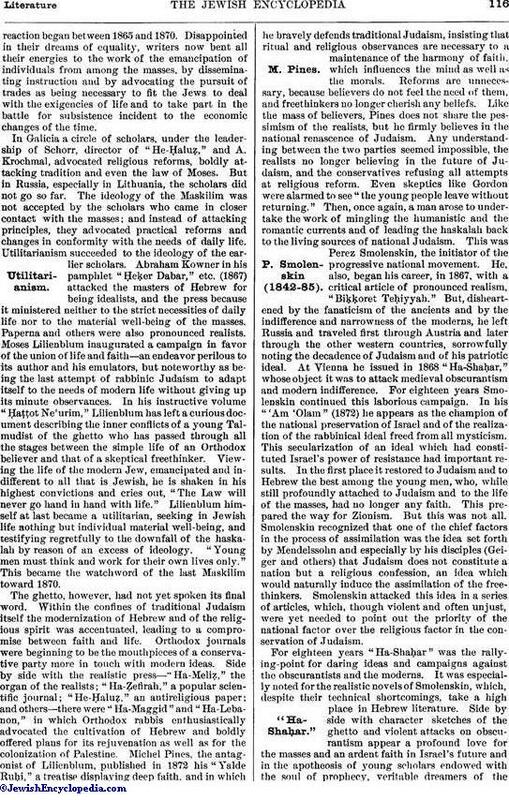 Modern Hebrew literature (1743-1904), in distinction to that form of Neo-Hebraic literature known as rabbinical literature (see Literature, Hebrew), which is distinctly religious in character, presents itself under a twofold aspect: (1) humanistic, relating to the emancipation of the language by a return to the classical models of the Bible, leading to the subsequent development of modern Hebrew; (2) humanitarian, dealing with the secularization of the language with a view to the religious and social emancipation of the Jews of the ghetto. These two tendencies are expressed by the word Haskalah, a term denoting the movement which predominated in Hebrew literature from the second half of the eighteenth century down to the death of Smolenskin in 1885. Beginning with the seventeenth century, many attempts were made to emancipate Hebrew from the forms and ideas of the Middle Ages. Italy, with critics and poets like Azariah dei Rossi, Leon of Modena, Francis, etc., who were inspired by the Italian Renaissance, led in this period of transition in Hebrew literature. But it was not until the appearance of Moses Ḥayyim Luzzatto that Hebrew poetry shook off the medieval fetters which hindered its free development. His allegorical drama "La-Yesharim Tehillah" (1743), which may be regarded as the first product of modern Hebrew literature, is a poem that in its classic perfection of style is second only to the Bible. In the less advanced countries especially it has contributed to the regeneration of Hebrew and has stimulated a host of imitators among writers removed from modern literary centers. At Amsterdam, Luzzatto's pupil, David Franco Mendes (1713-92), in his imitations of Racine ("Gemul 'Atalyah") and of Metastasio ("Yehudit"), continued his master's work, without, however, equaling Luzzatto's poetic inspiration and originality. 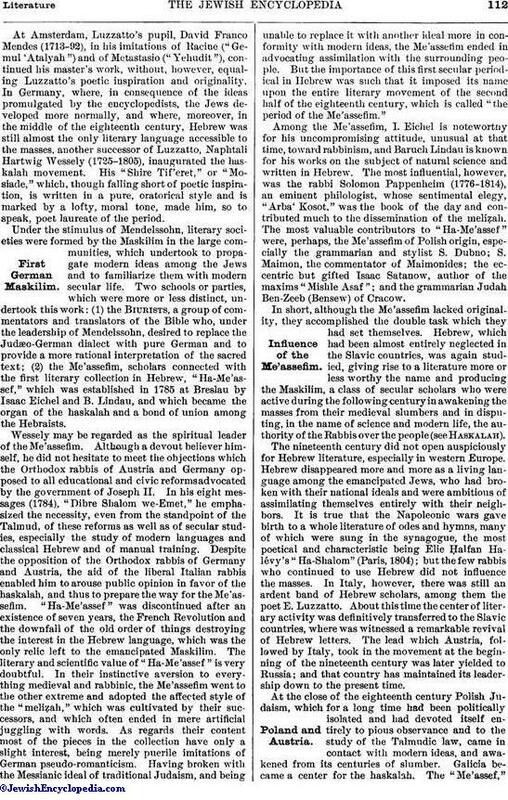 In Germany, where, in consequence of the ideas promulgated by the encyclopedists, the Jews developed more normally, and where, moreover, in the middle of the eighteenth century, Hebrew was still almost the only literary language accessible to the masses, another successor of Luzzatto, Naphtali Hartwig Wessely (1725-1805), inaugurated the haskalah movement. His "Shire Tif'eret," or "Mosiade," which, though falling short of poetic inspiration, is written in a pure, oratorical style and is marked by a lofty, moral tone, made him, so to speak, poet laureate of the period. Under the stimulus of Mendelssohn, literary societies were formed by the Maskilim in the large communities, which undertook to propagate modern ideas among the Jews and to familiarize them with modern secular life. Two schools or parties, which were more or less distinct, undertook this work: (1) the Biurists, a group of commentators and translators of the Bible who, under the leadership of Mendelssohn, desired to replace the Judæo-German dialect with pure German and to provide a more rational interpretation of the sacred text; (2) the Me'assefim, scholars connected with the first literary collection in Hebrew, "Ha-Me'assef," which was established in 1785 at Breslau by Isaac Eichel and B. Lindau, and which became the organ of the haskalah and a bond of union among the Hebraists. Wessely may be regarded as the spiritual leader of the Me'assefim. Although a devout believer himself, he did not hesitate to meet the objections which the Orthodox rabbis of Austria and Germany opposed to all educational and civic reforms advocated by the government of Joseph II. In his eight messages (1784), "Dibre Shalom we-Emet," he emphasized the necessity, even from the standpoint of the Talmud, of these reforms as well as of secular studies, especially the study of modern languages and classical Hebrew and of manual training. Despite the opposition of the Orthodox rabbis of Germany and Austria, the aid of the liberal Italian rabbis enabled him to arouse public opinion in favor of the haskalah, and thus to prepare the way for the Me'assefim. "Ha-Me'assef" was discontinued after an existence of seven years, the French Revolution and the downfall of the old order of things destroying the interest in the Hebrew language, which was the only relic left to the emancipated Maskilim. The literary and scientific value of "Ha-Me'assef" is very doubtful. In their instinctive aversion to everything medieval and rabbinic, the Me'assefim went to the other extreme and adopted the affected style of the "meliẓah," which was cultivated by their successors, and which often ended in mere artificial juggling with words. As regards their content most of the pieces in the collection have only a slight interest, being merely puerile imitations of German pseudo-romanticism. Having broken with the Messianic ideal of traditional Judaism, and being unable to replace it with another ideal more in conformity with modern ideas, the Me'assefim ended in advocating assimilation with the surrounding people. But the importance of this first secular periodical in Hebrew was such that it imposed its name upon the entire literary movement of the second half of the eighteenth century, which is called "the period of the Me'assefim." Among the Me'assefim, I. Eichel is noteworthy for his uncompromising attitude, unusual at that time, toward rabbinism, and Baruch Lindau is known for his works on the subject of natural science and written in Hebrew. The most influential, however, was the rabbi Solomon Pappenheim (1776-1814), an eminent philologist, whose sentimental elegy, "Arba' Kosot," was the book of the day and contributed much to the dissemination of the meliẓah. The most valuable contributors to "Ha-Me'assef" were, perhaps, the Me'assefim of Polish origin, especially the grammarian and stylist S. Dubno; S. Maimon, the commentator of Maimonides; the eccentric but gifted Isaac Satanow, author of the maxims "Mishle Asaf"; and the grammarian Judah Ben-Zeeb (Bensew) of Cracow. In short, although the Me'assefim lacked originality, they accomplished the double task which they had set themselves. 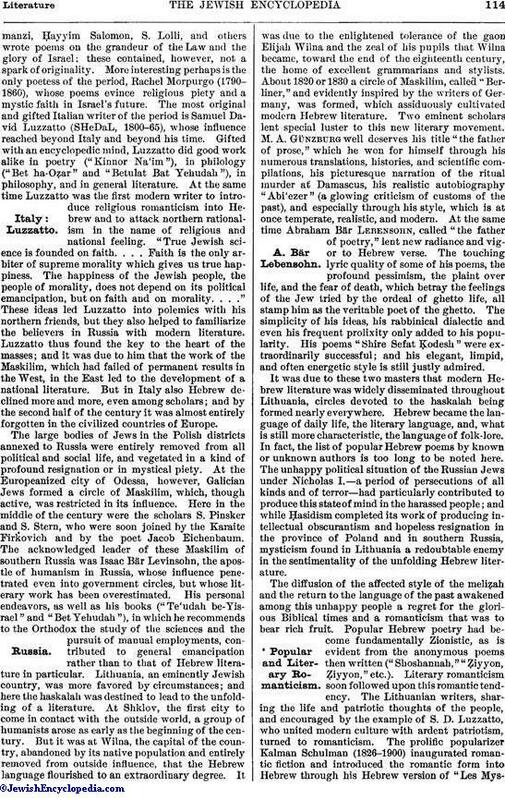 Hebrew, which had been almost entirely neglected in the Slavic countries, was again studied, giving rise to a literature more or less worthy the name and producing the Maskilim, a class of secular scholars who were active during the following century in awakening the masses from their medieval slumbers and in disputing, in the name of science and modern life, the authority of the Rabbis over the people (see Haskalah). The nineteenth century did not open auspiciously for Hebrew literature, especially in western Europe. Hebrew disappeared more and more as a living language among the emancipated Jews, who had broken with their national ideals and were ambitious of assimilating themselves entirely with their neighbors. It is true that the Napoleonic wars gave birth to a whole literature of odes and hymns, many of which were sung in the synagogue, the most poetical and characteristic being Elie Ḥalfan Halévy's "Ha-Shalom" (Paris, 1804); but the few rabbis who continued to use Hebrew did not influence the masses. In Italy, however, there was still an ardent band of Hebrew scholars, among them the poet E. Luzzatto. About this time the center of literary activity was definitively transferred to the Slavic countries, where was witnessed a remarkable revival of Hebrew letters. The lead which Austria, followed by Italy, took in the movement at the beginning of the nineteenth century was later yielded to Russia; and that country has maintained its leadership down to the present time. At the close of the eighteenth century Polish Judaism, which for a long time had been politically isolated and had devoted itself entirely to pious observance and to the study of the Talmudic law, came in contact with modern ideas, and awakened from its centuries of slumber. Galicia became a center for the haskalah. The "Me'assef,"which had been edited in a new series in Germany by Solomon ha-Kohen (Dessau, 1809-11), but without much success, was revived at Vienna and later in Galicia, and succeeded, first under the title of "Bikkure ha-'Ittim" (1820-31), and then under that of "Kerem Ḥemed" (1833-42), in gathering together many writers, the larger proportion of whom were Polish. In Poland, however, where the Jewish population lived apart, and could not even aspire to the dreams of equality and liberty of the German writers, the Maskilim were confronted with very complicated problems. On the one hand, political upheavals, modern instruction, and military service had paved the way for the mysticism of the Ḥasidim, which seized the masses despite the efforts of the liberal rabbis aided by writers like D. Samoscz and Tobias Feder. On the other hand, light literature and romantic imitations could not satisfy scholars saturated with Talmudic study. In order to meet these needs Hebrew literature descended from its heights to devote its attention to the necessities of daily life. Joseph Perl, a Mæcenas and himself a scholar, encouraged this movement, and published the parody "Megalleh Ṭemirin," directed against the superstitions and the cult of the Ḥasidic ẓaddiḳim. Solomon Judah Rapoport (1790-1867), who began by translating Racine and Schiller, now turned to the critical study of the past. By his able reconstruction of the lives and the scientific work of the masters of the Middle Ages, by his careful critical method, and by his devotion to the Law and the Jewish spirit, Rapoport created the Science of Judaism. But this science, which was warmly received especially by the cultivated minds of western Europe, could not satisfy the poor Polish scholars, living in entirely Jewish surroundings, and, no longer contented with the reasons advanced by the medieval masters, anxiously questioning the wherefore of the present and future existence of Israel. Then a master mind arose, to give an answer at once ingenious and adapted to the time. Nachman Krochmal, teaching gratuitously in his obscure corner of Poland, succeeded in uniting the propositions of modern critics with the principles of Judaism by the bond of nationalism, as it were, thus creating a Jewish philosophy in conformity with modern thought. Starting with Hegel's axiom of real and of absolute reason, Krochmal sets forth in his essays and in his ingenious Biblical and philosophic studies that the Jewish people is a concrete national organism, a separate unity, whose existence is justified, as the existence of all other nationalities is justified. But, at the same time, as the people of the Prophets, it has in addition a spiritual reason for its existence, which transcends national boundaries, and will join the entire human race in one bond. Many poets, scholars, and popular writers besides Rapoport and Krochmal contributed to the dissemination of Hebrew and to the emancipation of the Jews of Galicia. The satirical poet Isaac Erter (1792-1841), whose collection of essays, "Ha-Ẓofeh le-Bet Yisrael," is one of the purest works of modern Hebrew literature, attacked Ḥasidic superstitions and prejudices in a vigorous and classical style, marked by bright fancy and a cutting sarcasm which heaped ridicule upon the rabbi and satire upon the ẓaddiḳ. Meïr Halevy Letteris acquired merited renown and was for a long time considered poet laureate of the period by reason of his numerous translations, both in prose and in poetry, including "Faust" and works by Racine and Byron, and also on account of original lyric poetry, his song "Yonah Homiyyah" being a masterpiece. The popularizer of Galician history and geography, Samson Bloch, also won a reputation, although his insipid and prolix style does not warrant the success achieved by his works. The Galician scholar Judah Mises is noted especially for his violent attacks on rabbinical tradition and for his extreme radicalism, his work being continued by I. A. Schorr, the daring editor of "HeḤaluẓ." Outside of Galicia, where the scholars issued their works, and where periodicals multiplied, some of which were published at Vienna, as "Kokebe Yiẓḥaḳ" (ed. Stern), "Oẓar Neḥmad" (ed. Blumenfeld), Kerem Ḥemed, etc., groups of Maskilim or individual scholars were to be found toward the middle of the century in all the countries of Europe. In Germany the campaign for and against religious reform gave opportunity to certain scholars and rabbis to conduct their polemics in Hebrew. Zunz, Geiger, Z. Frankel, Jellinek, Carmoly, Fürst, J. Schwarz, and others, also published part of their works in Hebrew. Moses Mendelssohn of Hamburg, a pupil of Wessely and author of the maḳamat "Pene Tebel" (Amsterdam, 1872), may be considered as the epigone of the Me'assefim. In the Netherlands, especially at Amsterdam, there was also a circle of epigones, including the poet Samuel Molder (1789-1862). In Austria, Vienna was the depot for publishing Hebrew books and periodicals, and Prague became an active center for the haskalah. The best known among the Maskilim here is J. L. Jeiteles (1773-1838), author of witty epigrams ("Bene ha-Ne'urim") and of works directed against the Ḥasidim and against superstition, and director of the "Bikkure ha-'Ittim." There were scholars in Hungary also, the most gifted among them being Solomon Lewison of Moor (1789-1822), a remarkable stylist, whose classical "Meliẓat Yeshurun" places him above all the poets of the period. Gabriel Südfeld, father of Max Nordau, and Simon Bacher, may also be mentioned. The reflex of this movement was felt even in Rumania (J. Barasch, etc.). Galicia, however, the center of the haskalah, finally succumbed to Ḥasidism, while the moderns gave up Hebrew, and ended by more or less openly advocating assimilation. A few circles of Maskilim barely succeeded in perpetuating the Hebrew tradition, but had no influence on the masses. The Italian school exercised a more pronounced influence. I. S. Reggio (1784-1854) endeavored in his "Ha-Torah weha-Filosofiah" to reconcile modern thought with the Jewish law, while in his numerous writings and publications he openly sided with the German religious reformers. Joseph Almanzi,Ḥayyim Salomon, S. Lolli, and others wrote poems on the grandeur of the Law and the glory of Israel; these contained, however, not a spark of originality. More interesting perhaps is the only poetess of the period, Rachel Morpurgo (1790-1860), whose poems evince religious piety and a mystic faith in Israel's future. The most original and gifted Italian writer of the period is Samuel David Luzzatto (SHeDaL, 1800-65), whose influence reached beyond Italy and beyond his time. Gifted with an encyclopedic mind, Luzzatto did good work alike in poetry ("Kinnor Na'im"), in philology ("Bet ha-Oẓar" and "Betulat Bat Yehudah"), in philosophy, and in general literature. At the same time Luzzatto was the first modern writer to introduce religious romanticism into Hebrew and to attack northern rationalism in the name of religious and national feeling. "True Jewish science is founded on faith. . . . Faith is the only arbiter of supreme morality which gives us true happiness. The happiness of the Jewish people, the people of morality, does not depend on its political emancipation, but on faith and on morality. . . ." These ideas led Luzzatto into polemics with his northern friends, but they also helped to familiarize the believers in Russia with modern literature. Luzzatto thus found the key to the heart of the masses; and it was due to him that the work of the Maskilim, which had failed of permanent results in the West, in the East led to the development of a national literature. But in Italy also Hebrew declined more and more, even among scholars; and by the second half of the century it was almost entirely forgotten in the civilized countries of Europe. The large bodies of Jews in the Polish districts annexed to Russia were entirely removed from all political and social life, and vegetated in a kind of profound resignation or in mystical piety. At the Europeanized city of Odessa, however, Galician Jews formed a circle of Maskilim, which, though active, was restricted in its influence. Here in the middle of the century were the scholars S. Pinsker and S. Stern, who were soon joined by the Karaite Firkovich and by the poet Jacob Eichenbaum. The acknowledged leader of these Maskilim of southern Russia was Isaac Bär Levinsohn, the apostle of humanism in Russia, whose influence penetrated even into government circles, but whose literary work has been overestimated. His personal endeavors, as well as his books ("Te'udah be-Yisrael" and "Bet Yehudah"), in which he recommends to the Orthodox the study of the sciences and the pursuit of manual employments, contributed to general emancipation rather than to that of Hebrew literature in particular. Lithuania, an eminently Jewish country, was more favored by circumstances; and here the haskalah was destined to lead to the unfolding of a literature. At Shklov, the first city to come in contact with the outside world, a group of humanists arose as early as the beginning of the century. But it was at Wilna, the capital of the country, abandoned by its native population and entirely removed from outside influence, that the Hebrew language flourished to an extraordinary degree. It was due to the enlightened tolerance of the gaon Elijah Wilna and the zeal of his pupils that Wilna became, toward the end of the eighteenth century, the home of excellent grammarians and stylists. About 1820 or 1830 a circle of Maskilim, called "Berliner," and evidently inspired by the writers of Germany, was formed, which assiduously cultivated modern Hebrew literature. Two eminent scholars lent special luster to this new literary movement. M. A. Günzburg well deserves his title "the father of prose," which he won for himself through his numerous translations, histories, and scientific compilations, his picturesque narration of the ritual murder at Damascus, his realistic autobiography "Abi'ezer" (a glowing criticism of customs of the past), and especially through his style, which is at once temperate, realistic, and modern. At the same time Abraham Bär Lebensohn, called "the father of poetry," lent new radiance and vigor to Hebrew verse. The touching lyric quality of some of his poems, the profound pessimism, the plaint over life, and the fear of death, which betray the feelings of the Jew tried by the ordeal of ghetto life, all stamp him as the veritable poet of the ghetto. The simplicity of his ideas, his rabbinical dialectic and even his frequent prolixity only added to his popularity. His poems "Shire Sefat Ḳodesh" were extraordinarily successful; and his elegant, limpid, and often energetic style is still justly admired. It was due to these two masters that modern Hebrew literature was widely disseminated throughout Lithuania, circles devoted to the haskalah being formed nearly everywhere. Hebrew became the language of daily life, the literary language, and, what is still more characteristic, the language of folk-lore. In fact, the list of popular Hebrew poems by known or unknown authors is too long to be noted here. The unhappy political situation of the Russian Jews under Nicholas I.—a period of persecutions of all kinds and of terror—had particularly contributed to produce this state of mind in the harassed people; and while Ḥasidism completed its work of producing intellectual obscurantism and hopeless resignation in the province of Poland and in southern Russia, mysticism found in Lithuania a redoubtable enemy in the sentimentality of the unfolding Hebrew literature. The diffusion of the affected style of the meliẓah and the return to the language of the past awakened among this unhappy people a regret for the glorious Biblical times and a romanticism that was to bear rich fruit. 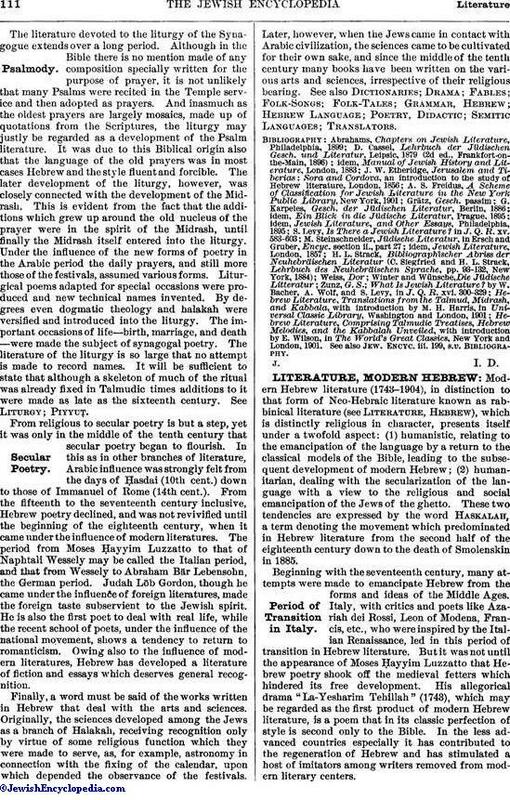 Popular Hebrew poetry had become fundamentally Zionistic, as is evident from the anonymous poems then written ("Shoshannah, Ẓiyyon, Ẓiyyon," etc.). Literary romanticism soon followed upon this romantic tendency. The Lithuanian writers, sharing the life and patriotic thoughts of the people, and encouraged by the example of S. D. Luzzatto, who united modern culture with ardent patriotism, turned to romanticism. The prolific popularizer Kalman Schulman (1826-1900) inaugurated romantic fiction and introduced the romantic form into Hebrew through his Hebrew version of "Les Mystèresde Paris" ("Mistere Paris"); and he became one of the civilizers of the ghetto through his numerous popular scientific works and especially through his studies of the Jewish past. His pure, flowing, meliẓah style, his extreme sentimentalism as well as his naive romanticism in all matters touching Judaism, won for him great influence. For fully half a century he, in spite of his lack of originality, ranked as a master. The young and gifted writer Micah Joseph Lebensohn (1828-52), the first true artist and romantic poet in Hebrew, has left poems that are perfect in style, including an admirable translation of the "Æneid," lyrics of love, of nature, and of sorrow. But his masterpieces are romantic poems ("Moses," "Judah ha-Levi") dealing with Israel's glorious past. The creator of the Hebrew novel was Abraham Mapu (1808-67), whose historical romance "Ahabat Ẓiyyon" exercised an important influence on the development of Hebrew. This novel, which deals with the golden age of Judah, that of Isaiah, and is couched in the very language of that prophet, is rather a succession of poetic pictures reconstructing the civilization of ancient Judea than a connected story. Simple and primitive in his thoughts, Mapu was so imbued with the spirit of the Bible that, although unconsciously, he was translated to ancient times, and, guided by a marvelous intuition, he succeeded in reconstructing the free, agricultural life of ancient Judah, in the land of the prophets, of justice, and of truth, the land of love and of the joy of life. This past, to renew which was the ambition of scholars and people, superimposed itself upon the present, and it was due to Mapu's novel that an entire people came forth from its long lethargy, to be reborn. Another novel ("Ashmat Shomeron") by Mapu served to increase his popularity. Many imitators of these leaders of Hebrew romanticism appeared, and at a time when the political outlook checked all hopes of a better life: the Maskilim demanded, in the name of the prophetic past, the rights of civilization and progress. Many persons, also, were won over to the reading of secular literature. 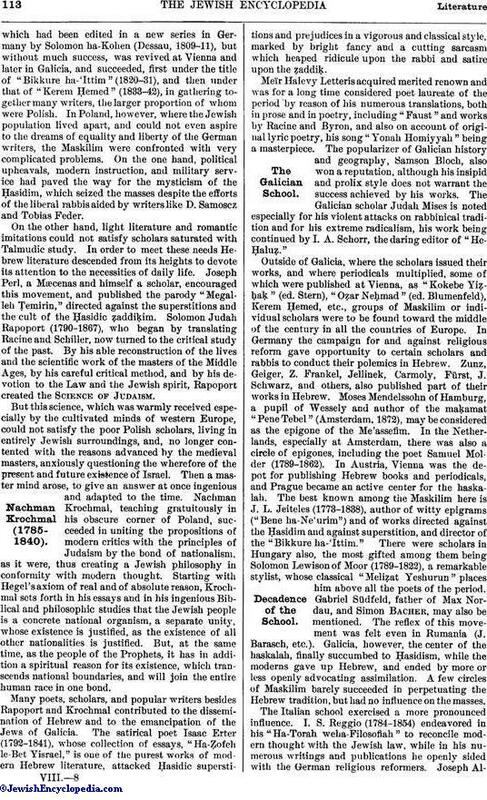 When in 1856 Silbermann founded at Lyck the first political journal in Hebrew, "Ha-Maggid," he met with unexpected success and had many imitators. In Austria, Russia, and even in Palestine, periodicals, more or less successful, appeared, furthering the cause both of Hebrew and of emancipation. Among these journals were "Ha-Karmel," founded by the scholar Samuel Joseph Fuenn; "Ha-Ẓefirah," founded by the popularizer of science C. Z. Slonimsky; and "Ha-Meliẓ," founded by A. Zederbaum. The accession of Alexander II. radically changed the condition of the Russian Jews. A wave of liberty and radicalism swept through the empire, and for the first time the Russian Jews could hope for a lot similar to that of their western coreligionists. Awakened from their century-long sleep, the backward people of the ghetto began to shake off religious and other fetters, becoming imbued with modern ideas and adopting modern modes of life. In the large centers there was no serious opposition to emancipation, and the Jews flocked in masses to the schools and sought secular employments. The scholars themselves, encouraged by the government and by the notables of the great cities, decided to attack all the "domains of darkness" of the past, and to occupy themselves with the affairs of the day; and when the small provinces, less disturbed by the economic and moral upheavals, bitterly opposed this social emancipation—which led to forgetfulness of the Law and endangered the faith—the Maskilim knew no limits to their fury against the fanatics of the ghetto. Hebrew literature, at first realistic, attacking customs and superstitions in the name of utility and the reality of things, became more and more anti-rabbinical as it opposed religious tradition. Mapu led the way in his novel "'Ayiṭ Ẓabua'," which, though a failure from a literary point of view, depicts the backward types of the ghetto, the Tartuffes, and the enemies to progress, with a realism intentionally exaggerated. Abramowitsch, then a young man, described in his novel "Ha-Abot we-ha-Banim" the customs of the Ḥasidim and the struggles of their progressive sons. The aged poet Abraham Bär Lebensohn published his drama, "Emet we-Emunah" (written twenty-five years previously), in which he satirized cabalistic hypocrisy and mysticism. The number of popularizers of science, critics of belated customs, and belittlers of the religious past became legion. The most distinguished among these writers was the poet Leon Gordon, an implacable enemy of the Rabbis, who personified in himself this realistic epoch. He began by writing romantic poems in imitation of the two Lebensohns. But when the horizon widened for the Russian Jews, he was filled with pity for the deplorable state of the Orthodox masses, to whom he addressed his "Haḳiẓah 'Ammi"—"Awake, my people, to a better life," i. e., "to the life of those about you." Of a mettlesome spirit, he unmercifully attacked the rabbinical law, the dead letter, the religious yoke weighing upon the masses. He regarded rabbinism as the greatest misfortune of the Jewish people, which killed the nation by delivering it up to the more secular Romans, and which hindered its participation in the realities of modern life. Gordon's activity covered all branches of literature. He ranks foremost in Hebrew literature as a satirical poet and critic of manners; and as a writer of fables he has no equal. But in spite of his apparent severity and his extreme skepticism, he remained at heart a patriot; and when he criticizes he does so in order to elevate the social life of the Jews, while grieving for the misery of the Messianic nation. Even in his historical poems, "Ẓidḳiyahu be-Bet ha-Peḳudot" and "Bi-Meẓulot Yam," he displays all his love for his people, which became more pronounced during the years of persecution and misery in Russia. But even then he believed that rabbinism was the enemy which prevented a national renascence. Gordon was among the first successfully to introduce Talmudisms into poetry. The hopes of the Maskilim were not realized: Russia did not continue its radical reforms; and areaction began between 1865 and 1870. Disappointed in their dreams of equality, writers now bent all their energies to the work of the emancipation of individuals from among the masses, by disseminating instruction and by advocating the pursuit of trades as being necessary to fit the Jews to deal with the exigencies of life and to take part in the battle for subsistence incident to the economic changes of the time. In Galicia a circle of scholars, under the leadership of Schorr, director of "He-Ḥaluẓ," and A. Krochmal, advocated religious reforms, boldly attacking tradition and even the law of Moses. But in Russia, especially in Lithuania, the scholars did not go so far. The ideology of the Maskilim was not accepted by the scholars who came in closer contact with the masses; and instead of attacking principles, they advocated practical reforms and changes in conformity with the needs of daily life. Utilitarianism succeeded to the ideology of the earlier scholars. Abraham Kowner in his pamphlet "Ḥeḳer Dabar," etc. (1867) attacked the masters of Hebrew for being idealists, and the press because it ministered neither to the strict necessities of daily life nor to the material well-being of the masses. Paperna and others were also pronounced realists. Moses Lilienblum inaugurated a campaign in favor of the union of life and faith—an endeavor perilous to its author and his emulators, but noteworthy as being the last attempt of rabbinic Judaism to adapt itself to the needs of modern life without giving up its minute observances. In his instructive volume "Ḥaṭṭot Ne'urim," Lilienblum has left a curious document describing the inner conflicts of a young Talmudist of the ghetto who has passed through all the stages between the simple life of an Orthodox believer and that of a skeptical freethinker. Viewing the life of the modern Jew, emancipated and indifferent to all that is Jewish, he is shaken in his highest convictions and cries out, "The Law will never go hand in hand with life." Lilienblum himself at last became a utilitarian, seeking in Jewish life nothing but individual material well-being, and testifying regretfully to the downfall of the haskalah by reason of an excess of ideology. "Young men must think and work for their own lives only." This became the watchword of the last Maskilim toward 1870. The ghetto, however, had not yet spoken its final word. Within the confines of traditional Judaism itself the modernization of Hebrew and of the religious spirit was accentuated, leading to a compromise between faith and life. Orthodox journals were beginning to be the mouthpieces of a conservative party more in touch with modern ideas. Side by side with the realistic press—"Ha-Meliẓ," the organ of the realists; "Ha-Ẓefirah," a popular scientific journal; "He-Ḥaluẓ," an antireligious paper; and others—there were "Ha-Maggid" and "Ha-Lebanon," in which Orthodox rabbis enthusiastically advocated the cultivation of Hebrew and boldly offered plans for its rejuvenation as well as for the colonization of Palestine. Michel Pines, the antagonist of Lilienblum, published in 1872 his "Yalde Ruḥi," a treatise displaying deep faith, and in which he bravely defends traditional Judaism, insisting that ritual and religious observances are necessary to a maintenance of the harmony of faith, which influences the mind as well as the morals. Reforms are unnecessary, because believers do not feel the need of them, and freethinkers no longer cherish any beliefs. Like the mass of believers, Pines does not share the pessimism of the realists, but he firmly believes in the national renascence of Judaism. Any understanding between the two parties seemed impossible, the realists no longer believing in the future of Judaism, and the conservatives refusing all attempts at religious reform. Even skeptics like Gordon were alarmed to see "the young people leave without returning." Then, once again, a man arose to undertake the work of mingling the humanistic and the romantic currents and of leading the haskalah back to the living sources of national Judaism. This was Perez Smolenskin, the initiator of the progressive national movement. He, also, began his career, in 1867, with a critical article of pronounced realism, "Biḳḳoret Teḥiyyah." But, disheartened by the fanaticism of the ancients and by the indifference and narrowness of the moderns, he left Russia and traveled first through Austria and later through the other western countries, sorrowfully noting the decadence of Judaism and of his patriotic ideal. At Vienna he issued in 1868 "Ha-Shaḥar," whose object it was to attack medieval obscurantism and modern indifference. For eighteen years Smolenskin continued this laborious campaign. In his "'Am 'Olam" (1872) he appears as the champion of the national preservation of Israel and of the realization of the rabbinical ideal freed from all mysticism. This secularization of an ideal which had constituted Israel's power of resistance had important results. In the first place it restored to Judaism and to Hebrew the best among the young men, who, while still profoundly attached to Judaism and to the life of the masses, had no longer any faith. This prepared the way for Zionism. But this was not all. Smolenskin recognized that one of the chief factors in the process of assimilation was the idea set forth by Mendelssohn and especially by his disciples (Geiger and others) that Judaism does not constitute a nation but a religious confession, an idea which would naturally induce the assimilation of the freethinkers. Smolenskin attacked this idea in a series of articles, which, though violent and often unjust, were yet needed to point out the priority of the national factor over the religious factor in the conservation of Judaism. For eighteen years "Ha-Shaḥar" was the rallying-point for daring ideas and campaigns against the obscurantists and the moderns. It was especially noted for the realistic novels of Smolenskin, which, despite their technical shortcomings, take a high place in Hebrew literature. Side by side with character sketches of the ghetto and violent attacks on obscurantism appear a profound love for the masses and an ardent faith in Israel's future and in the apotheosis of young scholars endowed with the soul of prophecy, veritable dreamers of theghetto. For the first time the Hebrew language, as modernized by Smolenskin, took immense strides. "Ha-Shaḥar" published only original work; and through the support and influence of its editor there arose a whole school of realists who wrote in Hebrew. In addition to Gordon and Lilienblum, there were Brandstädter (the clever creator of the short story in Hebrew), S. Mandelkern, J. L. Levin, Ben Ẓebi, M. Cohn, Silberbusch, Mandelstam, and others. Science was represented by S. Rubin, D. Kohan, Heller, D. Müller, etc. The influence of "Ha-Shaḥar" was felt throughout Hebrew literature. The popular poet and scholar of the south, A. B. Gottlober, founded his review "Ha-Boḳer Or" (1876) for the purpose of defending Mendelssohn and the haskalah. Gottlober himself contributed character sketches of the Ḥasidim, while the gifted writer R. A. Braudes began in its pages his novel "Ha-Dat weha-Ḥayyim," in which he depicts with masterly hand the struggle for the union of life and faith. Even America boasted a Hebrew journal, "Ha-Ẓofeh be-Ereẓ Nod," published by Sobel. 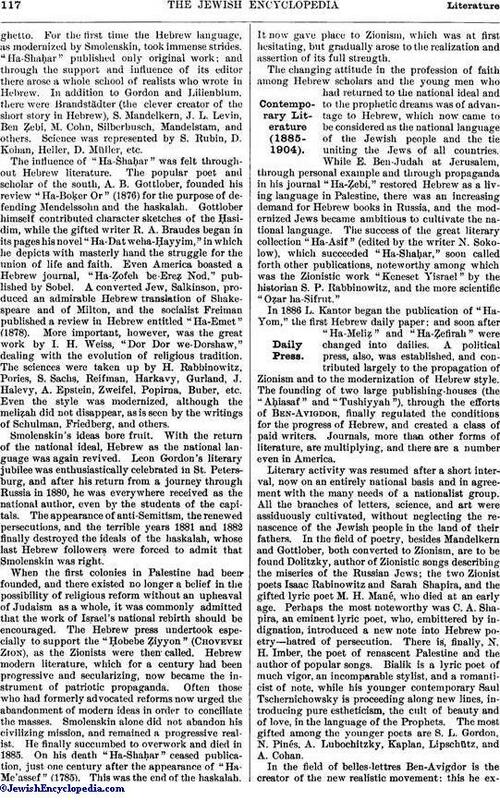 A converted Jew, Salkinson, produced an admirable Hebrew translation of Shakespeare and of Milton, and the socialist Freiman published a review in Hebrew entitled "Ha-Emet" (1878). More important, however, was the great work by I. H. Weiss, "Dor Dor we-Dorshaw," dealing with the evolution of religious tradition. The sciences were taken up by H. Rabbinowitz, Pories, S. Sachs, Reifman, Harkavy, Gurland, J. Halevy, A. Epstein, Zweifel, Popirna, Buber, etc. Even the style was modernized, although the meliẓah did not disappear, as is seen by the writings of Schulman, Friedberg, and others. Smolenskin's ideas bore fruit. With the return of the national ideal, Hebrew as the national language was again revived. Leon Gordon's literary jubilee was enthusiastically celebrated in St. Petersburg, and after his return from a journey through Russia in 1880, he was everywhere received as the national author, even by the students of the capitals. The appearance of anti-Semitism, the renewed persecutions, and the terrible years 1881 and 1882 finally destroyed the ideals of the haskalah, whose last Hebrew followers were forced to admit that Smolenskin was right. When the first colonies in Palestine had been founded, and there existed no longer a belief in the possibility of religious reform without an upheaval of Judaism as a whole, it was commonly admitted that the work of Israel's national rebirth should be encouraged. The Hebrew press undertook especially to support the "Ḥobebe Ẓiyyon" (Chovevei Zion), as the Zionists were then called. Hebrew modern literature, which for a century had been progressive and secularizing, now became the instrument of patriotic propaganda. Often those who had formerly advocated reforms now urged the abandonment of modern ideas in order to conciliate the masses. Smolenskin alone did not abandon his civilizing mission, and remained a progressive realist. He finally succumbed to overwork and died in 1885. On his death "Ha-Shaḥar" ceased publication, just one century after the appearance of "Ha-Me'assef" (1785). This was the end of the haskalah. It now gave place to Zionism, which was at first hesitating, but gradually arose to the realization and assertion of its full strength. The changing attitude in the profession of faith among Hebrew scholars and the young men who had returned to the national ideal and to the prophetic dreams was of advantage to Hebrew, which now came to be considered as the national language of the Jewish people and the tie uniting the Jews of all countries. While E. Ben-Judah at Jerusalem, through personal example and through propaganda in his journal "Ha-Ẓebi," restored Hebrew as a living language in Palestine, there was an increasing demand for Hebrew books in Russia, and the modernized Jews became ambitious to cultivate the national language. The success of the great literary collection "Ha-Asif" (edited by the writer N. Sokolow), which succeeded "Ha-Shaḥar," soon called forth other publications, noteworthy among which was the Zionistic work "Keneset Yisrael" by the historian S. P. Rabbinowitz, and the more scientific "Oẓar ha-Sifrut." 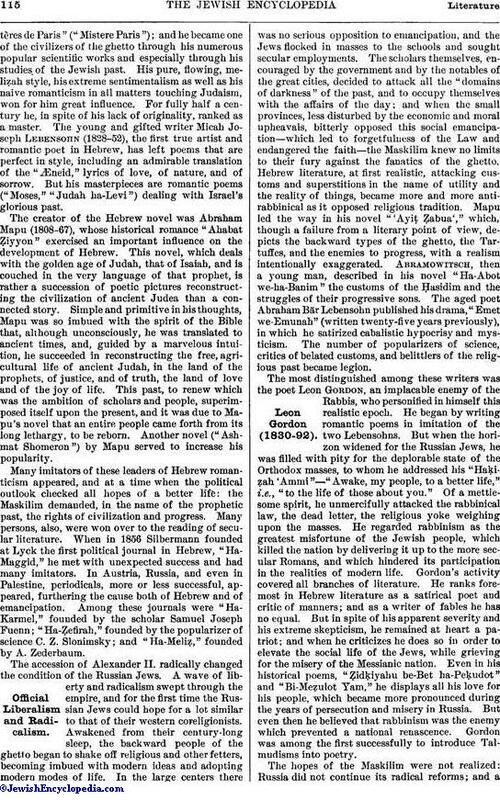 In 1886 L. Kantor began the publication of "Ha-Yom," the first Hebrew daily paper; and soon after "Ha-Meliẓ" and "Ha-Ẓefirah" were changed into dailies. A political press, also, was established, and contributed largely to the propagation of Zionism and to the modernization of Hebrew style. The founding of two large publishing-houses (the "Aḥiasaf" and "Tushiyyah"), through the efforts of Ben-Avigdor, finally regulated the conditions for the progress of Hebrew, and created a class of paid writers. Journals, more than other forms of literature, are multiplying, and there are a number even in America. Literary activity was resumed after a short interval, now on an entirely national basis and in agreement with the many needs of a nationalist group. All the branches of letters, science, and art were assiduously cultivated, without neglecting the renascence of the Jewish people in the land of their fathers. 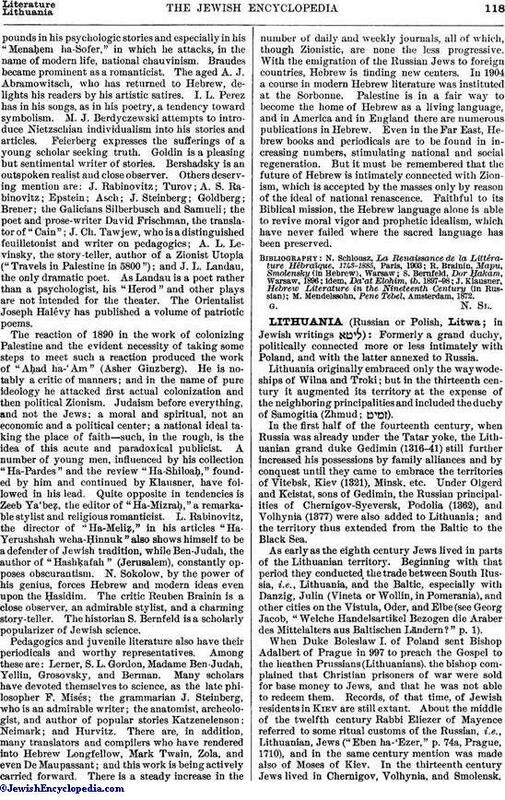 In the field of poetry, besides Mandelkern and Gottlober, both converted to Zionism, are to be found Dolitzky, author of Zionistic songs describing the miseries of the Russian Jews; the two Zionist poets Isaac Rabinowitz and Sarah Shapira, and the gifted lyric poet M. H. Mané, who died at an early age. Perhaps the most noteworthy was C. A. Shapira, an eminent lyric poet, who, embittered by indignation, introduced a new note into Hebrew poetry—hatred of persecution. There is, finally, N. H. Imber, the poet of renascent Palestine and the author of popular songs. Bialik is a lyric poet of much vigor, an incomparable stylist, and a romanticist of note, while his younger contemporary Saul Tschernichowsky is proceeding along new lines, introducing pure estheticism, the cult of beauty and of love, in the language of the Prophets. The most gifted among the younger poets are S. L. Gordon, N. Pinés, A. Lubochitzky, Kaplan, Lipschütz, and A. Cohan. In the field of belles-lettres Ben-Avigdor is the creator of the new realistic movement; this he expoundsin his psychologic stories and especially in his "Menaḥem ha-Sofer," in which he attacks, in the name of modern life, national chauvinism. Braudes became prominent as a romanticist. The aged A. J. Abramowitsch, who has returned to Hebrew, delights his readers by his artistic satires. I. L. Perez has in his songs, as in his poetry, a tendency toward symbolism. M. J. Berdyczewski attempts to introduce Nietzschian individualism into his stories and articles. Feierberg expresses the sufferings of a young scholar seeking truth. Goldin is a pleasing but sentimental writer of stories. Bershadsky is an outspoken realist and close observer. Others deserving mention are: J. Rabinovitz; Turov; A. S. Rabinovitz; Epstein; Asch; J. Steinberg; Goldberg; Brener; the Galicians Silberbusch and Samueli; the poet and prose-writer David Frischman, the translator of "Cain"; J. Ch. Tawjew, who is a distinguished feuilletonist and writer on pedagogics; A. L. Levinsky, the story-teller, author of a Zionist Utopia ("Travels in Palestine in 5800"); and J. L. Landau, the only dramatic poet. As Landau is a poet rather than a psychologist, his "Herod" and other plays are not intended for the theater. The Orientalist Joseph Halévy has published a volume of patriotic poems. The reaction of 1890 in the work of colonizing Palestine and the evident necessity of taking some steps to meet such a reaction produced the work of "Aḥad ha-'Am" (Asher Ginzberg). He is notably a critic of manners; and in the name of pure ideology he attacked first actual colonization and then political Zionism. Judaism before everything, and not the Jews; a moral and spiritual, not an economic and a political center; a national ideal taking the place of faith—such, in the rough, is the idea of this acute and paradoxical publicist. A number of young men, influenced by his collection "Ha-Pardes" and the review "Ha-Shiloaḥ," founded by him and continued by Klausner, have followed in his lead. Quite opposite in tendencies is Zeeb Ya'beẓ, the editor of "Ha-Mizraḥ," a remarkable stylist and religious romanticist. L. Rabinovitz, the director of "Ha-Meliẓ," in his articles "Ha-Yerushshah weha-Ḥinnuk" also shows himself to be a defender of Jewish tradition, while Ben-Judah, the author of "Hashḳafah" (Jerusalem), constantly opposes obscurantism. N. Sokolow, by the power of his genius, forces Hebrew and modern ideas even upon the Ḥasidim. The critic Reuben Brainin is a close observer, an admirable stylist, and a charming story-teller. The historian S. Bernfeld is a scholarly popularizer of Jewish science. Pedagogics and juvenile literature also have their periodicals and worthy representatives. Among these are: Lerner, S. L. Gordon, Madame Ben-Judah, Yellin, Grosovsky, and Berman. Many scholars have devoted themselves to science, as the late philosopher F. Misés; the grammarian J. Steinberg, who is an admirable writer; the anatomist, archeologist, and author of popular stories Katzenelenson; Neimark; and Hurvitz. There are, in addition, many translators and compilers who have rendered into Hebrew Longfellow, Mark Twain, Zola, and even De Maupassant; and this work is being actively carried forward. There is a steady increase in the number of daily and weekly journals, all of which, though Zionistic, are none the less progressive. With the emigration of the Russian Jews to foreign countries, Hebrew is finding new centers. In 1904 a course in modern Hebrew literature was instituted at the Sorbonne. Palestine is in a fair way to become the home of Hebrew as a living language, and in America and in England there are numerous publications in Hebrew. Even in the Far East, Hebrew books and periodicals are to be found in increasing numbers, stimulating national and social regeneration. But it must be remembered that the future of Hebrew is intimately connected with Zionism, which is accepted by the masses only by reason of the ideal of national renascence. Faithful to its Biblical mission, the Hebrew language alone is able to revive moral vigor and prophetic idealism, which have never failed where the sacred language has been preserved. M. Mendelssohn, Pene Tebel, Amsterdam, 1872.